Grumbling on with much heat and very little clarity is the vexed question of "passporting", the name given for the system within the Single Market where financial institutions, once authorised in any Member State are free to establish branches and to provide cross-border services throughout the Community on the basis of the fundamental principle of home country supervision. Established in 1993, it has since been extended to cover most financial services and contributes to the creation of the largest single free market in financial services anywhere in the world, giving London a significant advantage as a global financial centre. Crucially, the passporting system has been extended to all EEA states, so that if the UK remained in the EEA, it would continue to enjoy passporting benefits. Third countries only enjoy limited rights, under what is known as "third country passporting" or "equivalency", and then only on the basis of a guarantee of reciprocity, permitting other EEA businesses equal access to the UK market. However, with the UK government yet to commit itself to continued EEA membership, some major US banks, such as Goldman Sachs, Morgan Stanley and BlackRock are getting nervous. Their presence in the UK is as much to do with the access afforded to the EEA market and, without that guaranteed, they are thinking about having to relocate. 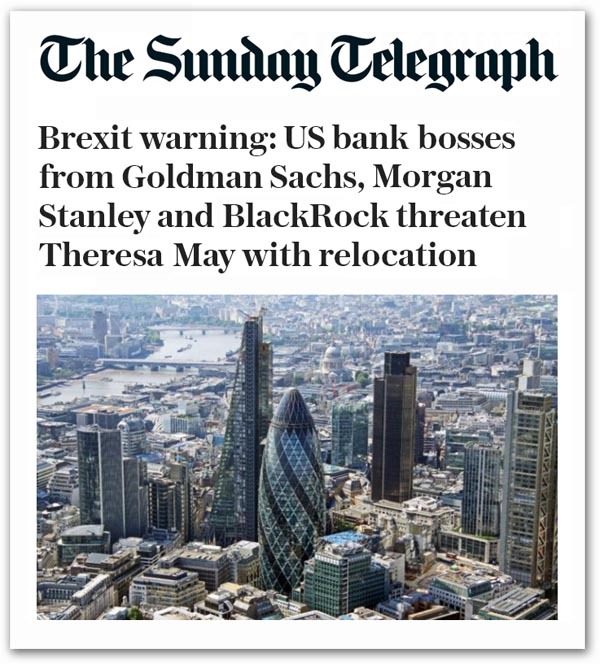 That much we are getting from The Sunday Telegraph which is breaking with recent tradition by actually running a news story in its pages, telling us that the bosses of several of America's biggest banks and corporations have warned Theresa May they will pre-emptively shift operations into Europe unless she can provide early clarity on the future shape of EU-UK relations. The ultimatum, we are told, was delivered at a round-table meeting with Mrs May in New York this week attended by a host of key US investors, including major City investors such as Goldman Sachs, Morgan Stanley and BlackRock – conveyed after Mrs May had declined to provide information about how the British government would approach the Brexit negotiations. This, of course, is extremely damaging to the "hard Brexit" advocates, who want to pull us out of the EU without a settled deal, impaled as they are on their rhetoric on free movement of persons. Unable to cope with the idea of the Article 112 EEA mechanism which gives them a workable solution to controlling the (relatively minor) problem of EEA migration. As Booker pointed out last week, the EU/EEA contributes the smaller part of our overall immigration, and securing controls over this particular aspect is not going to make significant inroads into the problem. Despite this, the "lunatic fringe" is determined to throw the baby out with the bathwater, damaging our vital interests in trade in financial services, and putting at risk anything from 40,000 to 80,000 jobs over the next decade. Even if losses are exaggerated – and no-one knows what they will be – the prospect of big-name pulling out of London piles huge pressure on Mrs May to find a solution to Brexit, which reconciles controls over free movement of persons with continued participation in the EEA. She could do no better than look here for a solution which is all the more stronger for having been rejected by the lunatic fringe. As least there seems to be an air of realism in some quarters of Whitehall, with Chancellor Philip Hammond now cautioning banks that the retention of "passporting" is highly unlikely if Mrs May gives in to the crazies and dumps the Single Market. With highly-paid consultants crawling over this issues, it is now about time they stopped churning out the same derivative boiler-plate, and started exploring that which is already known to EUReferendum.com readers, that the EEA Article 112 mechanism provides a perfectly adequate solution to the current impasse. For the want of better intelligence, they are having to make do with the likes of Anthony Browne, chief executive of the British Bankers' Association, who has been calling for "transitional arrangements" to allow banks and other financial institutions to make plans to deal with the loss of passporting rights. However, he - like others – is beginning to realise that even this will require an immense amount of good will on the part of the "colleagues, which may not be there when we come calling. That much is acknowledged by professor Alan Winters, director of the UK Trade Policy Observatory, who concedes that financial services is "very complicated" and asking the EU to concede transitional arrangements is fixing one key piece of the negotiation before it has even started. Winters says: "We'd be asking them to give away one of their biggest pieces of leverage". What no one on the politico-media nexus is doing at the moment, though, is joining up the dots. Financial services are but one sector which will be adversely affected by dumping the Single Market. And even if it is making the most noise at the moment, others can't be far behind. Sooner rather than later, Mrs May is going to have to cut through the stupidity and ignorance and concede that the only option for a "transitional arrangement" is to stay in the EEA, ignoring the noisemakers. Otherwise, it isn't a blue passport she will be looking at, but a passport to oblivion as she faces the 2020 general election with the wreckage of what was once Brexit.